JULES VERNE SCHOOL: TERCERO-FOURTH GRADE: Happy Feet - An inclusion story. NARRATOR 1: WE ARE GOING TO TELL YOU A STORY ABOUT AN EMPEROR KING. NARRATOR: 2 EVERY EMPEROR PENGUIN SINGS A UNIQUE SONG CALLED THE HEART SONG. IF THE MALE PENGUINS HEART SONG MATCHES THE FEMALE SONG THE TWO PENGUINS MATE. NORMA JEAN: I LOVE YOU TOO. MEMPHIS: WILL YOU BE MY MATE. NORMA JEAN: YES, YES OF COURSE. NARRATOR: 3 THEIR LIFE WAS VERY HAPPY. NORMA JEAN: WE HAVE AN EGG NOW, AND YOU HAVE TO TAKE CARE OF IT. MEMPHIS: YES, DON'T WORRY I WILL TAKE CARE OF IT. NARRATOR: 1 BUT SOMETHING WENT WRONG, AND THE EGG WAS DROPPED. GLORIA: DON'T WORRY. DON'T WORRY. NARRATOR: 2 GLORIA TAPS THE EGG, AND TWO FEET COME OUT FROM THE EGG, AND A SMALL PENGUIN IS BORN. GLORIA: I WILL NAME YOU MISTER MUMBLE..
NARRATOR: 3 TIME HAS PASSED AND MUMBLE IS VERY WORRIED. GLORIA: YES, YES YOU CAN. ELDERS: YOU HAVE TO GO. YOU CANNOT SING. SHAME ON YOU. GO, GO, AWAY. NARRATOR: 1 MUMBLE LEAVES THE COMMUNITY VERY SAD. NARRATOR: 2 AS HE IS WALKING THROUGH THE SNOW, HE MEETS SOME PENGUINS CALLED AMIGOS. RAMON: HEY YOU, OVER THERE. NESTOR: WHAT IS YOUR NAME? PATRICIA: COME WITH US. JOIN OUR GROUP. 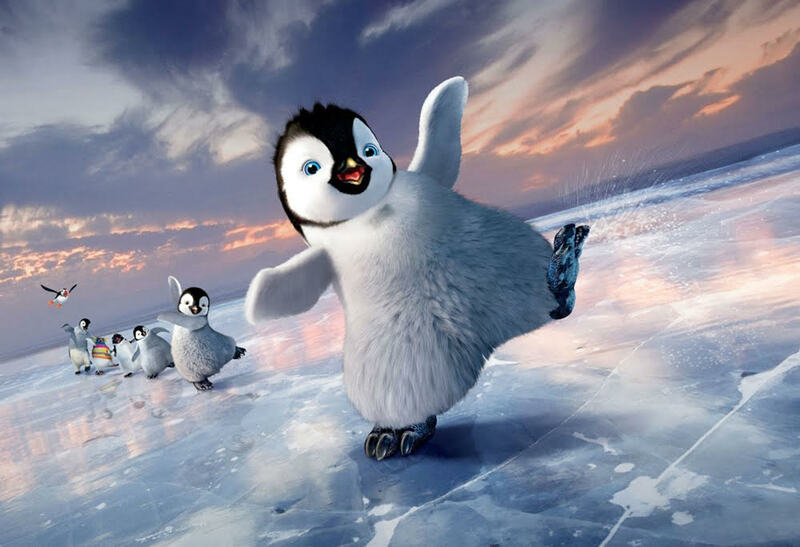 NARRATOR: 2 MUMBLE AND HIS NEW FRIENDS BREAK THE ICE, START TO SWIM AND HAVE A WONDERFUL TIME. NARRATOR: 3 MUMBLE WAS HAVING A WONDERFUL TIME WITH HIS FRIENDS. NARRATOR: 1 BUT SUDDENLY SOME HUNTERS CAME AND TOOK MUMBLE TO A ZOO IN AUSTRALIA. ANNE: YOU HAVE TO WALK, DANCE SWIM, HURRY. MUMBLE: I'M SO SAD, WHAT CAN I DO? JOHN WOLF : DON'T WORRY I WILL HELP YOU. JOHN: TOMORROW NIGHT, I WILL DIG A HOLE UNDER YOUR CAGE AND THEN YOU CAN ESCAPE. MUMBLE: THANK YOU, THANK YOU. NARRATOR: 2 THE NEXT NIGHT JOHN DUG A HOLE ON MUMBLE'S CAGE. NARRATOR: 3 HE WALKED AND SWAM FOR MANY MILES UNTIL HE REACHED HOME. JANE : HE IS COMING. HE IS COMING. BETTY: HE LOOKS SO NICE. NARRATOR: 1 A BIG PARTY IS ORGANIZED ON HIS HONOR AND EVERYBODY DANCED WITH HIM. NARRATOR - 2 FINALLY MUMBLE IS ACCEPTED BY THE WHOLE COMMUNITY AS TAP DANCER. EVERYBODY: WE HAVE TO LEARN TO ACCEPT AND LOVE THOSE WHO HAVE DIFFERENT ABILITIES.